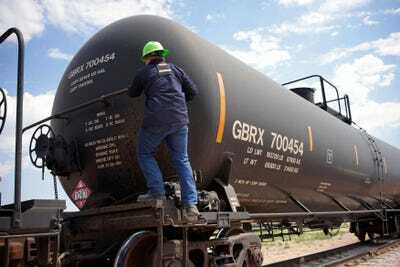 REUTERS/Rick WilkingA worker climbs onto a crude oil train to set the handbrake at the Eighty-Eight Oil LLC’s transloading facility in Ft. Laramie, Wyoming July 15, 2014. DOUGLAS, Wyo. (AP) — Law enforcement officials in east-central Wyoming say they’re seeing more crimes committed by workers newly arrived to the area’s booming oil fields and don’t have enough police and jail space to handle the problem. Serious crimes including aggravated assault and larceny are up 17 per cent in the Douglas area since 2009, according to the Wyoming Division of Criminal Investigation. Emergency calls are up 9 per cent from last year. Drug arrests are up from 37 in 2009 to 64 last year. And police were involved in two vehicle pursuits in September — the first in the city in three years, according to the Douglas Police Department. The increase is nothing like the violent crime that spiked in North Dakota communities after oil production in the Bakken field surged several years ago. Still, local law enforcement agencies already are showing signs of strain. The Douglas Police Department is short two officers as city employees quit to work in the oil fields, the Casper Star-Tribune reports. Meanwhile, the Converse County Sheriff’s Office is sending prisoners to Wheatland because their numbers exceed the number of local jail cells. Many people Schmidt arrests already have felony convictions, ranging from a fourth domestic battery to multiple DUI arrests. Schmidt said he tends to see much higher numbers when transient workers breathe into his breathalyzer. Their blood-alcohol concentrations sometimes reach 0.3 per cent, more than four times the legal limit for driving, he said. In one of the recent pursuits, the driver topped 100 mph before flipping his car in a construction zone. In the other, a drunken driver destroyed 30 feet of fence near Douglas High School. Both pursuits involved energy industry workers, Schmidt said.